Two people sit at a rectangular table. They each take turns to place a coin on the table, and they'll keep going until the entire table is covered in coins. Coins cannot be placed on top of each other. The first person who cannot put a coin down loses. How does each player assure they win? The puzzle comes in many varieties, some have the devil play a person for their soul, others phrase the question differently, and others do something different again. The trap comes into play when you rig it so it's impossible for a party member to win against you, so what's the solution? Each person can assure they win by going first, and putting a coin in the exact center of the table. This dictates the symmetry of what the eventual table will look like when it's covered in coins. Since you placed the coin in the center, all other coins must be placed around it. Every coin the second person will place down can be mirrored by the first. So if the second person puts a coin down to the right of the first placed coin, the first person can then put one down on the left. 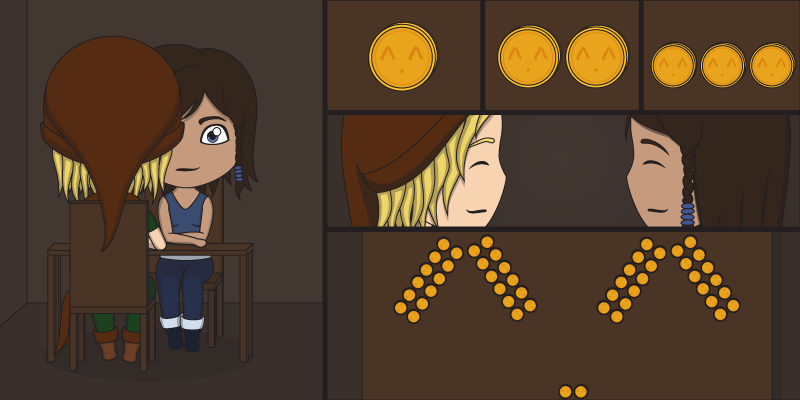 This'll continue until the table is completely full, and the second person has no room left to place a coin down. Note that simply placing a coin anywhere else on the table won't matter. The person who went first will always be able to mimic the placements exactly. So if you think you're being smart by placing a coin anywhere else on the table to try and create a new symmetry, player one will simply put a coin down in the exact same position on the opposite side of the table to keep the symmetry going. If you want this puzzle to work as a trap you simply make sure you go first. But if you want it to be a puzzle you simply ask for an answer to the original question. However, the question "How does each player assure they win?" is purposely misleading. Some might assume you have to figure out how both players could win, which isn't the case. So by phrasing the question differently you can make the puzzle harder or easier.